Feline chronic renal failure (CRF) causes high levels of phosphorus in your cat's blood, since the kidneys can no longer excrete excess phosphorus out of the cat's system. High levels of phosphorus lead to a secondary condition known as hyperphosphataemia, that causes CRF to worsen more quickly, and can result in secondary hyperparathyroidism. To avoid these issues and improve the condition of your CRF cat, you need to give your cat phorphorus binders, such as aluminum hydroxide, to prevent the absorption of phosphorus in the cat's intestines, with each meal. Take your cat to a veterinarian to determine its phosphorus level. A cat with a level above 4.0 mg/dl needs aluminum hydroxide supplementation in its food. The exact level will determine the dosage of the phosphorus binder you add to your cat's food each day. Weigh your cat using a baby or pet scale and record this number in pounds. When a veterinarian tests your cat's phosphorus levels, you can also ask him to weigh your cat and write it down for you. To get an approximate weight, hold your cat while you weigh yourself on a human scale. Subtract your weight from the total to determine the cat's weight. Calculate the dosage of aluminum hydroxide you will administer to your cat daily, divided over two to three meals. Cats with a phosphorus level between 4.0 mg/dl and 6.0 mg/dl get 25 mg per pound of body weight each day, according to Tanya's Comprehensive Guide to Feline Chronic Renal Failure. Those with a level between 6.0 mg/dl and 8.0 mg/dl get 50 mg per pound. Cats with a level above 8.0 mg/dl get 100 mg per pound of weight. 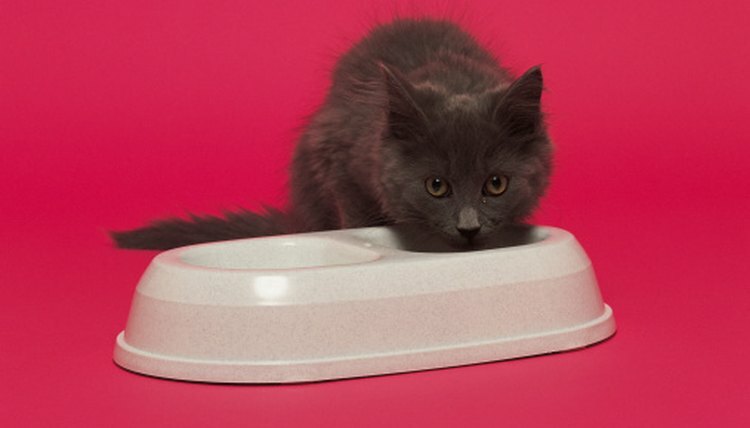 Measure the daily dose of aluminum hydroxide liquid or powder for the day, then divide it into two or three servings, depending on how many meals your cat will have during the day. Open and empty aluminum hydroxide capsules or crush tablets into a dish to measure out the correct amount. As a reference, 1/4 tsp. of powder contains 300 mg aluminum hydroxide and 1 tsp. of liquid (such as Alternagel) contains 600 mg. Mix the powder or liquid into your cat's canned food. To reduce the gritty texture from the powder, add 1 tsp. of water or low-sodium chicken broth to the food and let it sit for 10 minutes before serving. If your cat refuses to eat the powder in its food, administer the liquid version of aluminum hydroxide into its mouth directly with a dropper or syringe (without a needle). Open the cat's mouth with your finger and squirt the medicine onto the cat's tongue. For dry food, sprinkle the aluminum hydroxide powder over the kibble and mix it together in a bowl or plastic bag, leave it overnight to mingle, then serve it to your cat. Feed a low-phosphorus diet to cats with CRF. Heat the canned food containing the cat's medication for three to five seconds in the microwave to increase its odor, making it more palatable for your cat. If another household cat eats some of the food containing a phosphorus binder, make sure it gets some normal food as well, especially a young cat that requires phosphorus in its diet. Provide fresh water for your CRF cat at all times to help its kidneys filter out toxins and decrease nausea, encouraging it to eat more. Is it Safe to Give My Cat Vaseline As a Hair Ball Treatment? Can I Feed My Cat Cooked Hamburger?